In the not-too-distant future, an American military commander is preparing to take charge of counterinsurgency operations in the Narabad Province of remote and mountainous Khanastan, an impoverished region scarred by war and ruled by diverse religious and tribal communities. As part of his preparations, he enters a stunningly real conflict-mapping simulation that allows him to see the results of his on-the-ground decisions within hours. What he learns shocks him. His initial efforts to take control of the situation--by establishing a secure forward operating base, pressuring the local population to support his soldiers, providing armed escorts to government leaders, and taking the fight to the enemy--lead to chaos, increasing the danger to his troops and making the insurgents more numerous and deadly. He consults with his two mentors, a battlehardened war fighter and a provocative devil's advocate, then rewinds the scenario and tries again. And again. But whatever he does falls short of effective counterinsurgency, leading to more violence and to consequences he never expected. He grows frustrated, unsure if he and his soldiers can do anything at all to defeat the enemy and claim victory. It's only when he discards obsolete strategies and old measures of success and formulates a nontraditional--and more cold-blooded--approach that his efforts gain traction and the insurgency starts to weaken. He begins to see that effective counterinsurgency demands a new way of thinking. And a new way of fighting. In the tradition of military classics such as The Defence of Duffer's Drift, this powerful parable illustrates the urgent need for military leaders to rethink how they fight contemporary conflicts. It reads like a thriller, with a cast of vivid characters, even as it puts forward a bold approach to effective counterinsurgency operations and makes a compelling case for change. A journey through the mind of a commander as he learns and adapts in a complex, deadly environment. One of the world's premier practitioners challenges conventional wisdom about counterinsurgency, using a parable to help leaders develop the mental agility to be successful. A fictional commander participates in virtual reality combat situations that illustrate the chaos, complexity, and uncertainty of modern conflict-and he fails repeatedly, learning and adapting with each set of experiences. This highly practical parable avoids checklists and formulas; it teaches leaders how to think and how to develop the mental courage to learn, adapt, and make decisions in the face of a deadly and resilient enemy. An innovative tool for developing in peacetime the mental agility and adaptability our leaders need to be successful in combat. 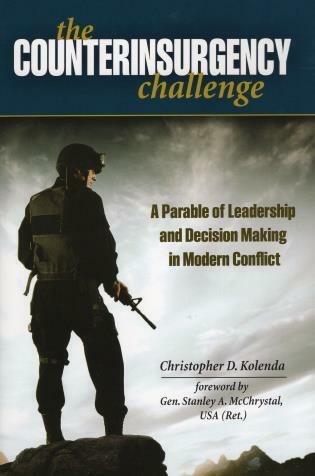 Christopher Kolenda is a graduate of West Point, a former West Point instructor, and a retired Army officer. Gen. Stanley A. McChristal is a retired four-star general and the former commander of U.S. forces in Afghanistan.